A portrait of the Camp David retreat, from a former commanding officer of the facility. During the Bill Clinton and George W. Bush administrations, Giorgione, a retired rear admiral, was the CO at Camp David, a sprawling compound in the Maryland woods that includes a theater, bowling alley, pool, gym, horseshoe pits, driving range, bicycles, golf carts, helicopter port, chapel, weather station, maintenance shops, and gift shop, as well as the presidential quarters and many guest cottages. True to its mission, Camp David has no place for the press, and, as can be expected, the author does not offer details regarding security arrangements. Since World War II and the days of Franklin Roosevelt, whose cottage had the only indoor plumbing, there have been countless officers posted with their families at the now-luxurious getaway; command is regularly rotated. Giorgione consulted with other COs to provide this pop history of a vacation spot with a strictly limited clientele. For more than seven decades, every president and his family have enjoyed fine amenities and devoted treatment. (No word from Giorgione, though, regarding the present occupant of the White House, who seems to prefer to rusticate at Mar-a-Lago.) The author opines “that the president is a person like you and me, as far as a psychological and emotional makeup go,” a debatable assertion. 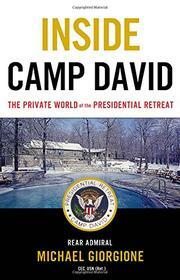 Camp David has also been a site for many summits and diplomatic meetings that kept the staff working overtime. The crew must be strictly apolitical, offering every president the utmost respect that the military owes the commander in chief. Civilians, however, may detect, despite relaxed presidential pleasantries, a faint air of obsequious servility. Along with the placid yarns of chief executives and their folks, the author also offers some basic counsel on the art of management.